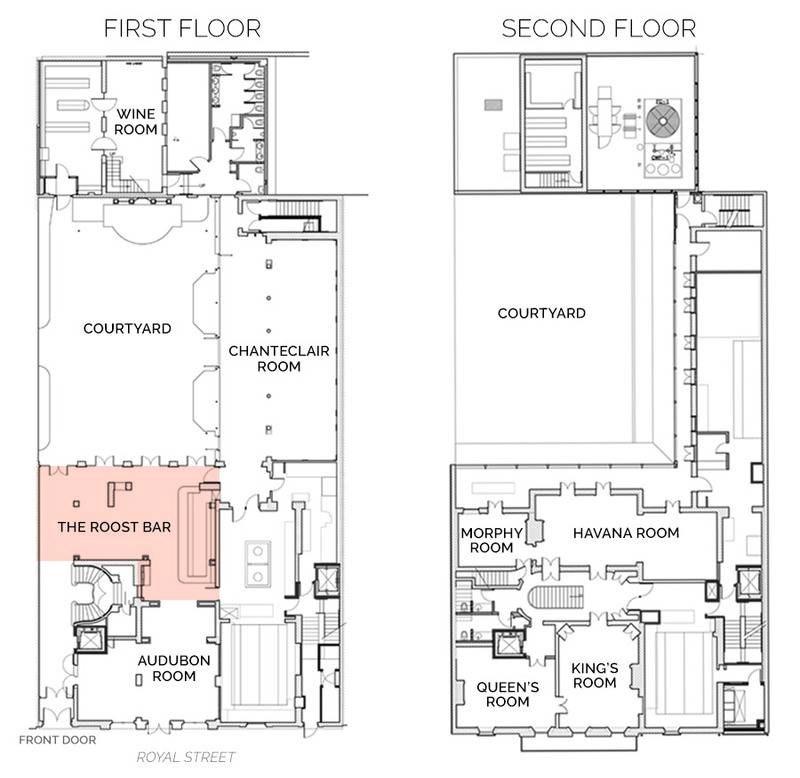 The rooster rules the roost at the The Roost Bar, a veritable aviary perched in an airy, open room overlooking the lush Courtyard. A spectacular mural of a gilded birdcage lines the back wall, picturing our feathered friends the ostrich, rooster, flamingo, and hen. Called the Taxidermy of Exotic Birds, the work is a reverse painted mirror by artist Alice Ludlow, created through a process called verre églomisé, in which the backside of glass is gilded with antique mercury. The courtyard's reflection offers a seamless integration with the exterior, the outside flooding in through the giant mirror. Under the mural, a fifteen-foot banquette by Greg Arceneaux in the style of a French bench and covered in pomegranate ostrich leather, sits upon the building's original flagstone floor. 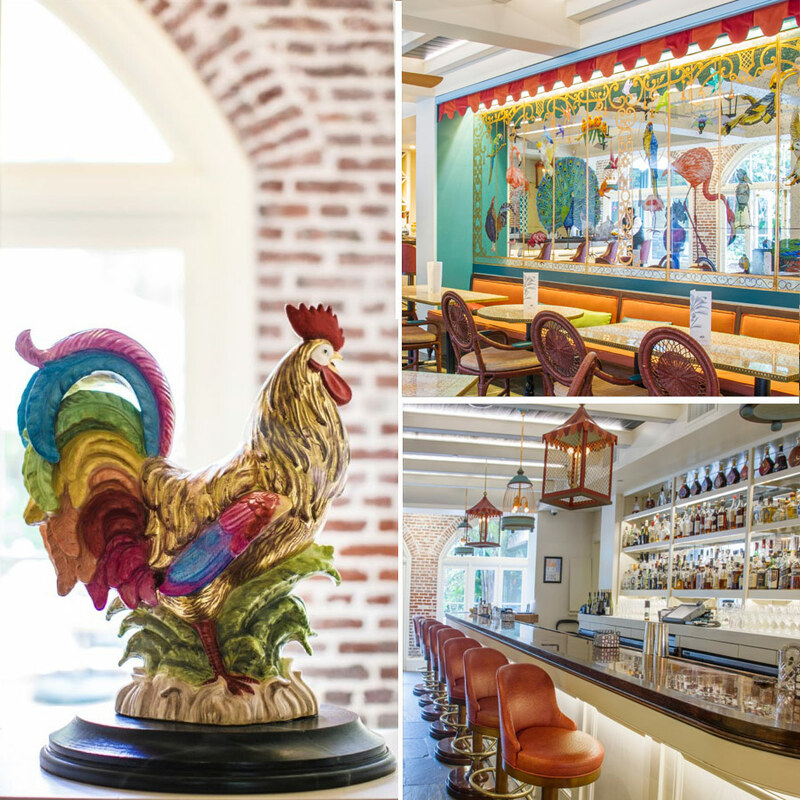 Whimsical bird cages by designer Julie Neil, hang above the handsome bar, and tables by local artist Robert Ortiz feature crushed egg shells set in resin with an embossed brass edging. Two old fashioned bladed ceiling fans from the Woolen Mill Fan Company in Pennsylvania spin above. The design is named after birds, of course - the Direct Drive Ostrich Inherit Wind fan. Their turning creates a gentle lap of breeze – or could it be birds taking flight?